Since Jan 1, 2013, all open ended mutual fund schemes including equity and debt fund started to offer Direct Plans alongside with the Regular Plans. This started an era of self-investing in mutual funds without the assistance of financial advisors or need to visit a distributor for investing into a mutual fund by investors. After the introduction of the direct plans by SEBI in September 2012, its popularity has increased with the retail investors. It has provided investors, the much-needed flexibility in the planning of an investment portfolio who likes to do it yourself. 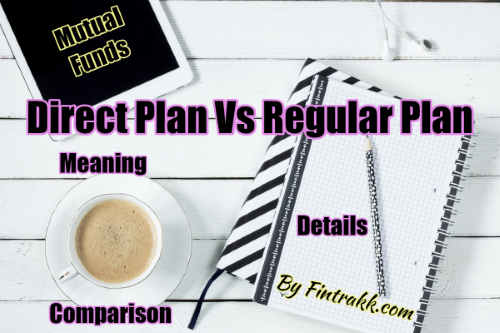 Direct Plan vs Regular Plan: Difference & How it affects your investment? The primary difference between the Direct Plan and Regular Plan is the Expense Ratio. An expense ratio is the fees that an Asset Management Company (AMC) incurs in operating a mutual fund scheme. The ratio represents the percent of total asset it manages goes into the expense. Expense Ratio of a mutual fund includes Management Fees, legal expenses, and commission to distributors or financial advisors which make up the major portion of the ratio. As the Direct Plans of mutual fund schemes are offered to investors directly from the AMC without any intermediaries, the distribution expenses get eliminated from the fund. This, in turn, makes the fund cheaper and helps the AMC to pass on the benefit to the investors which can be in an excess to 1 percent than Regular Plans. Though the exact difference between both the plans in terms of returns looks small but turns out to be a big saving in the long term. We will compare it with two different mutual funds in large cap segment. ALSO READ 10 Things to know before buying Health Insurance in India ! Disclaimer: Kindly note these are just examples to explain this concept. This post is for informational purpose only and it should not be regarded as investment advice in any regard. It is seen in the charts that investment of Rs.100000 in the direct plan on Aug 2014 would now be Rs. 157673.7 in three years whereas in Regular plan the same investment would be now Rs 153179.5. The Direct Plan of the scheme is giving an excess return of around 3 percent. In this fund, the investment of Rs.100000 in the direct plan on Aug 2014 would now be 166854 in three years whereas in Regular plan the same investment would be now RS.161834.1. The Direct Plan of the scheme is giving an excess return of around 3.3 percent. How much effective are Direct Plans? Opting a Direct Plan while investing has certain limitation over Regular Plans. An investor has to have good knowledge of the financial market (which is a good thing). But, as an active investor he has to be on his toes to protect the investment from under performing in this market volatility. An investor with little knowledge of the financial market choosing a direct plan will be like a shot in the dark. Whereas, in a Regular Plan, an investor is advised by their financial advisor on their investment from time to time. The advisor gives various suggestions on increasing the return of the portfolio according to the risk profile. ALSO READ What is SIP? What are the benefits of investing through SIP? Direct Plan vs Regular Plan: Which one is better? Direct Plans are popular among large institutional investors and high net-worth investors (HNI). It provides them with the flexibility to choose an investment plan while saving a huge sum of money. For Retail investors, it depends on the profile of an investor. Those with a busy schedule who cannot keep a check on their investment portfolio or those with a little knowledge on the working of the financial market should opt for regular plans. Because in an attempt to save a part of expense ratio, you may lose more if informed decisions and prompt actions are not taken. Whereas, capable investors who can understand, plan and service their investment needs can choose the direct plan without a second thought. How to switch from Regular to Direct Plans? Switching from a Regular plan to Direct plan in the same fund, one needs to fill up the common transaction form and submit it with the switching request. The services are also available through mutual fund website if an online transaction is enabled in your investment. In this process, the money doesn’t get credited to your bank account. The earlier investment in the regular fund is sold off and in place of that new direct plan is purchased by the fund house. For SIP or Systematic Investment Plan, the investor needs to give the written application with the details and intent to transfer all the remaining SIP to direct plan. Since switching involves redemption, the capital gain tax will be applicable wherever possible. ALSO READ PPF or ELSS - Which is better Investment ? Direct Plan Mutual Funds scores over Regular Plans in terms of returns and flexibility to investors. The main objective for the introduction of Direct Mutual Fund Plan was for greater access to the availability of mutual fund schemes for the investor community without the assistance of MF distributors. Also, lower expense ratio in Direct Plans helped in achieving better returns than regular funds. As we have discussed, the different aspects of Direct vs Regular plans in details, it is understood that both have some pros and cons. There’s no “one fit all” situation here. In Regular plans, investor incurs the maximum expense ratio However, this also minimises the risk you may have while investing otherwise. Whereas Direct Plans are primarily for those who are the Do it Yourself (DIY) investors. Now, that you have gone through Direct plan vs Regular Plan difference. Which one do you prefer? Direct Mutual Fund Plan or Regular plans? Do share your choice and any opinions on the same.